Kay Miniver doesn't fly a Spitfire in dogfights over London or ply the North Sea in a battleship, but she's doing her all for wartime England. And she does it so well that Winston Churchill would say Mrs. Miniver was more vital to the nation than a fleet of destroyers. Winner of six Academy Awards including Best Picture, this memorable spirit-lifter about an idealized England that tends to its prize-winning roses while confronting the terror of war struck a patriotic chord with audiences and became 1942's #1 box-office hit. Greer Garson gives a formidable Oscar-winning title-role performance, comforting children in a bomb shelter, capturing an enemy parachutist and delivering an inspirational portrait of stiff-upper lip British resolve. 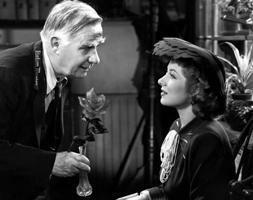 When Hitler did his worst, Mrs. Miniver did her best. Propaganda films were a dime a dozen during World War II, with most focusing on men in uniform and their valiant efforts against a bitter and relentless foe. 'Mrs. Miniver,' however, was different and unique. William Wyler's understated, sensitive, and utterly involving portrait of a British family and their day-to-day struggles during the German Blitz brings the homefront to the forefront, and with keen perception chronicles the personal battles fought there. Though violence comes at a premium, the standing of 'Mrs. Miniver' as one of the all-time great World War II movies remains undiminished. (It won six Oscars, including Best Picture, Director, Actress, Supporting Actress, Screenplay, and Cinematography, and received a total of 10 nominations.) Along with David O. Selznick's 'Since You Went Away,' which salutes American wartime families, 'Mrs. Miniver' depicts how everyday people confront extraordinary challenges during difficult times, and with courage, dignity, and unyielding will take a united stand against a common evil. Their heroics may be small, but they're as meaningful and important as any on the battlefield, and with simple grace, 'Mrs. Miniver' pays tribute to them. Wyler's film resonates so strongly and remains timeless because it's populated by identifiable, upstanding citizens who, for the most part, espouse attitudes and ideals akin to our own. Like many of us, the Minivers are a typical family with a stoic yet warm father, Clem (Walter Pidgeon); a spirited, nurturing mother, Kay (Greer Garson); and three children - a grown son, Vin (Richard Ney), and a boy and girl under the age of 10. Though the Minivers are a bit better off than most clans (okay, they're loaded, but still considered upper middle class by British standards), in the carefree days before the first strike of war, Kay still feels guilty about purchasing an extravagant hat. (Clem expresses far less remorse about buying a new roadster.) Vin, just home from Oxford, falls in love with Carol (Teresa Wright), granddaughter of the grouchy, disapproving town dowager, Lady Beldon (Dame May Whitty), and enrolls in flight school immediately following the declaration of war. Clem joins the neighborhood watch, Kay tends to the children, and in between periodic air-raids (which they calmly weather with steely resolve in the shelter adjacent to their home), they all try to maintain a sense of normalcy, honoring their beliefs and not permitting outside forces to alter their way of life. It's a good message, and one that's still relevant in our post-9/11 society. Wyler does a fine job illustrating the Minivers' easygoing, idyllic existence before the war, and the leisurely pacing allows us to settle in and bond with the family before German bombs begin to fall. (In many ways, the film's episodic structure mirrors that of 'Meet Me in St. Louis' - produced two years later - which also was based on a series of stories with little cohesive narrative tying them together.) As time passes, the Minivers endure more than their share of drama - Clem joins a fleet of small boats aiding in the Dunkirk evacuation while Kay tangles with a wounded German soldier who invades her home - but their strength and nobility never seem phony or self-righteous. After all, the Minivers are British (even though Garson is the only member of the family with an accent), and such behavior is expected from the empire's dutiful subjects. Of course, that impervious attitude is never more apparent than in the film's most iconic scene. Holed up in their shelter, awaiting the nightly attack, Kay quietly reads 'Alice in Wonderland' to the children while Clem smokes his pipe and drinks tea. A distant barrage can be heard, but it doesn't ruffle their nerves or impinge on their casual conversation. Soon, the squeal of dropping bombs disrupts the calm, but Kay steadies herself with knitting. As the attack intensifies and explosions rock the shelter, the children succumb to panic. Trapped in the cramped surroundings, unable to see outside, and bracing themselves for impact amid the interminable whistling of free-falling missiles, the family huddles together as Kay and Clem comfort the crying children. It's a harrowing sequence - tense, taut, claustrophobic, with sound the only indicator of impending doom - and with one brilliant brushstroke, Wyler paints an indelible portrait of a brave nation under siege. 'Mrs. Miniver' was the top moneymaking film of 1942 and British Prime Minister Winston Churchill was its number one fan, deeming the propaganda it spouted more powerful than a squadron of battleships. The film defined the Brits' practical outlook and stubborn determination, and cautioned the Nazis not to underestimate civilian fortitude. Other countries might collapse under the strain of incessant bombing, the film implied, but not England, which was breeding an army of Mrs. Minivers, all of whom were ready and eager to protect their homeland whatever the cost. Garson was one of the most respected actresses of the 1940s, earning six Academy Award nominations between 1939 and 1945. Though studio chief Louis B. Mayer originally wanted Norma Shearer to play Kay Miniver (Shearer reportedly declined the part because her vanity wouldn't allow her to be seen onscreen as the mother of a teenager), it's impossible to imagine anyone other than Garson in the role. A touch of affectation occasionally creeps into her portrayal, but a refreshing naturalness and ingratiating charm pervade her work, and her comfortable rapport with Pidgeon, with whom she co-starred in eight pictures from 1941 to 1953, makes them quite believable as a married couple. Pidgeon also received an Oscar nomination (losing to James Cagney in 'Yankee Doodle Dandy'), but his performance seems wooden by comparison. A radiant Wright, who was nominated for Best Actress the same year for the Lou Gehrig biopic 'The Pride of the Yankees,' justly earned her Best Supporting Actress Oscar with a luminous portrayal that beautifully complements Garson's in both vision and tone, and a pre-Clarence Henry Travers received a Supporting Actor nod as the mild-mannered station master who names a rose after Kay and brazenly enters it in the town's annual flower show, much to the displeasure of Lady Beldon, who has monopolized the contest for decades. Add to all this an interesting bit of trivia: Garson and Richard Ney, the young actor who portrays her oldest son in the film, fell in love during shooting. The 27-year-old Ney was 11 years Garson's junior, and a rightly nervous MGM persuaded the couple to put off their marriage until the initial promotional and release cycle of 'Mrs. Miniver' concluded. Still, in hindsight, knowing the details of their off-screen relationship, it's a tad creepy watching Ney call Garson "mother" throughout the movie, and seeing her shower him with maternal affection. Four years after 'Mrs. Miniver,' Wyler would win another Best Director Oscar for another Best Picture homefront film, 'The Best Years of Our Lives,' which chronicles the readjustment struggles returning soldiers face when reuniting with their families. The movie nicely bookends 'Mrs. Miniver' and proves Wyler possessed a special understanding of domestic dynamics and interpersonal relations during stressful times. Though World War II tested the strength of England's inimitable stiff upper lip, 'Mrs. Miniver' provided vital reinforcement at a critical juncture, bolstering morale abroad and infusing an agitated America, which had just entered the conflict, with some much-needed inspiration. And despite the passage of time and a shift in attitude, that inspiration hasn't waned. 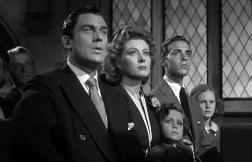 Like her or not, Mrs. Miniver remains a role model for the ages, and the film that bears her name still merits our attention. 'Mrs. 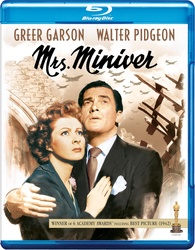 Miniver' arrives on Blu-ray packaged in a standard case. Video codec is 1080p/AVC MPEG-4 and default audio is DTS-HD Master Audio mono. Once the disc is inserted into the player, the static menu with music immediately pops up; no previews or promos precede it. There's something about the black-and-white photography of the 1940s that's so seductive and entrancing, it makes color seem unnecessary. And when it's impeccably restored and transferred to high definition, as it has been here, it can be jaw-droppingly beautiful. 'Mrs. 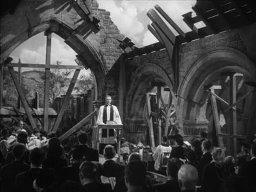 Miniver' looks superb on Blu-ray, sporting an image bursting with perfectly pitched contrast and marvelous clarity. As soon as the opening credits roll, it's immediately apparent we're in for a visual treat, and for its entire 133-minute running time, the quality of this stellar effort from Warner never wavers. A smattering of light grain lends the image a cozy warmth and heightens the appearance and variance of textures, but never does the picture seem processed. Joseph Ruttenberg's Oscar-winning cinematography is meticulously preserved, with a wide gray scale enhancing the impact of light and shadows, increasing depth perception, and illuminating background elements. Blacks are rich and silky, shadow delineation is especially good, and even during low-lit nocturnal scenes crush is kept at bay. Vibrant whites nicely accent various scenes, and close-ups, though often shot in soft focus, are crisp and lovely. The source material is spotless, with nary a speck or scratch marring the image, and no noise, banding, or pixelation intrudes. Best of all, the transfer appears free of digital tinkering and exudes a fluid, natural feeling throughout. 'Mrs. Miniver' is a stirring film, and the visual potency of this top-notch rendering makes it more involving and immediate than ever before. 'Mrs. Miniver' possesses a surprisingly active soundscape (it received an Oscar nomination for Best Sound Recording), and the DTS-HD Master Audio 1.0 mono track included here honors it to the fullest. Whistles are the star of this sonic show, whether they be the spritely toots of a train engine, the delicate warbles of an approaching figure, or, most notably, the ear-splitting whines of cascading bombs. The decibel levels run the gamut, but the effects are clean, crisp, and startlingly realistic. Gentle atmospherics are rendered well, too, but the accents really shine, punching up the track without overwhelming it. As a whole, the sound fills the room well. Herbert Stothart's string-laden music score emits a fine tone, and dialogue is generally clear and easy to understand, though a few exchanges are a bit muffled. Any age-related defects, such as hiss, pops, static, or crackles, have been erased, so quiet moments, especially the tense stand-off between Kay and the German soldier, achieve a stronger degree of resonance and impact. Bass frequencies are strong, too. The bombing sequences produce a good degree of heft, even without subwoofer involvement, and while a bit of distortion creeps into the scene showing the small crafts gathering en masse on the Thames River, the low-end presence is strikingly pronounced. Despite perceptions to the contrary, 'Mrs. Miniver' requires a charged audio presentation, and this transfer delivers quite nicely. All the extras from the previous DVD release have been ported over to this Blu-ray edition. A new audio commentary (like the one that graces the 'Grand Hotel' disc) and a retrospective featurette would have been nice additions, but sadly are not included here. Vintage Newsreel Footage: "1942 Academy Awards" (SD, 1 minute) – Greer Garson accepts her Best Actress Oscar for 'Mrs. Miniver' from the previous year's winner, Joan Fontaine, and gives a heartfelt speech - a la Sally Field - about being accepted by the American film industry. This one-minute excerpt only skims the surface of Garson's marathon address, which - at a whopping five minutes and 30 seconds - holds the record as the longest Academy Awards acceptance speech in history. The following year, the Academy of Motion Picture Arts and Sciences instituted a time limit, much to the continued relief of colleagues and spectators alike. Vintage Cartoon: 'Blitz Wolf' (SD, 11 minutes) – This topical, edgy, and often hilarious Tex Avery cartoon uses the Three Little Pigs tale as a springboard for a satire on Hitler's aggression and the iron nerve of the Allies. Avery pulls no punches in his disdain for the Third Reich, and the anti-German and Japanese sentiment is surprisingly blatant for an animated short. A disclaimer precedes the cartoon warning of ethnic prejudice and stereotypes, but if viewed in its proper context, 'Blitz Wolf' is a rousing piece of wartime propaganda that flings barbs like bombs and adeptly uses humor to stoke the passions of its audience. Vintage Short: 'Mr. Blabbermouth!' (SD, 19 minutes) – This amusing and informative 1942 short chronicles the danger of rumor in a wartime society. According to the film, Hitler employed insidious rumor to brainwash the German populace during his rise to power, and if left unchecked in the U.S., such unfounded gossip might bring down the war effort. The short also examines U.S. weapons and its military and industrial strength, and compares them to that of Japan. Vintage Short: 'For the Common Defense' (SD, 21 minutes) – Also from 1942, this "Crime Doesn't Pay" short looks at how the efforts of Central and South American countries to manipulate U.S. citizens into traitorous activities for economic gain will be foiled at every turn. Though brisk and entertaining, the short's real attraction is the appearance of both a young Van Johnson in one of his first film roles as a U.S. government agent and a young Stephen McNally (billed here as Horace McNally) as a Latin official. Theatrical Trailer (SD, 3 minutes) – The film's wide release trailer, touting it as the most important film of the past decade, is also included on the disc. Another Best Picture winner comes to Blu-ray, and 'Mrs. Miniver,' seven decades after its initial release, still merits the accolade. A warm, moving, and often tense study of courage and defiance, this wartime classic is a model of fine moviemaking. William Wyler's firm yet sensitive direction coupled with a gallery of first-rate performances and impeccable production values combine to produce a film that's as involving and affecting today as it surely was back in 1942. Warner's Blu-ray edition does the picture proud, with a beautiful black-and-white video transfer and potent audio that immerses us in the on-screen action. Though more supplements that relate directly to 'Mrs. Miniver' would have been a welcome addition to this package, the film itself and its marvelous high-def presentation easily earn it a top recommendation.